An increase on both previous years. Last year I wrote 53 and in 2010 I wrote 74 posts. However as you’ll see in the graph below there were some very fallow times! 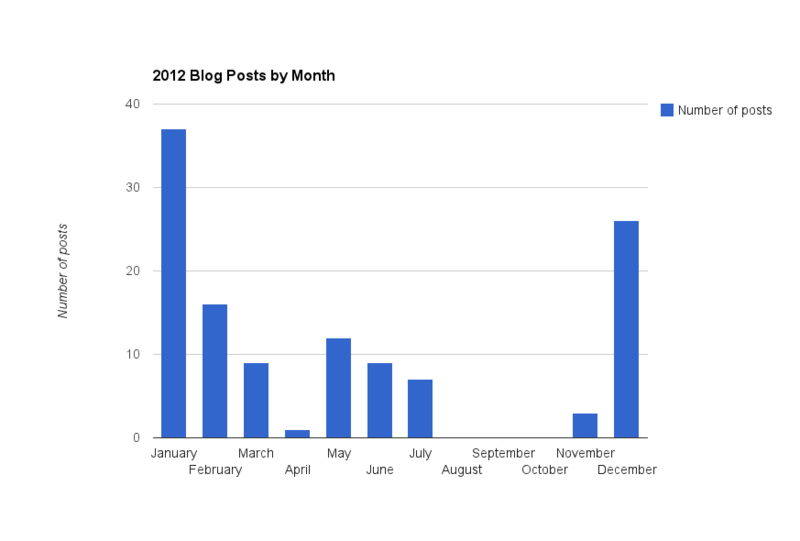 April had 1 post, and I didn’t write a single thing between in August, September or November. 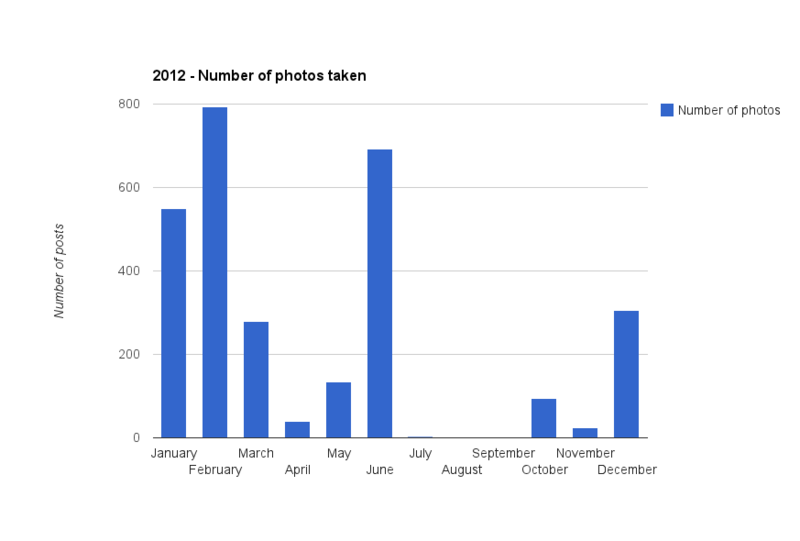 I would guess about half of my posts are in the photoblog as well. Absolutely fantastic. A massive increase on the previous year (12,323 more unique visitors!). 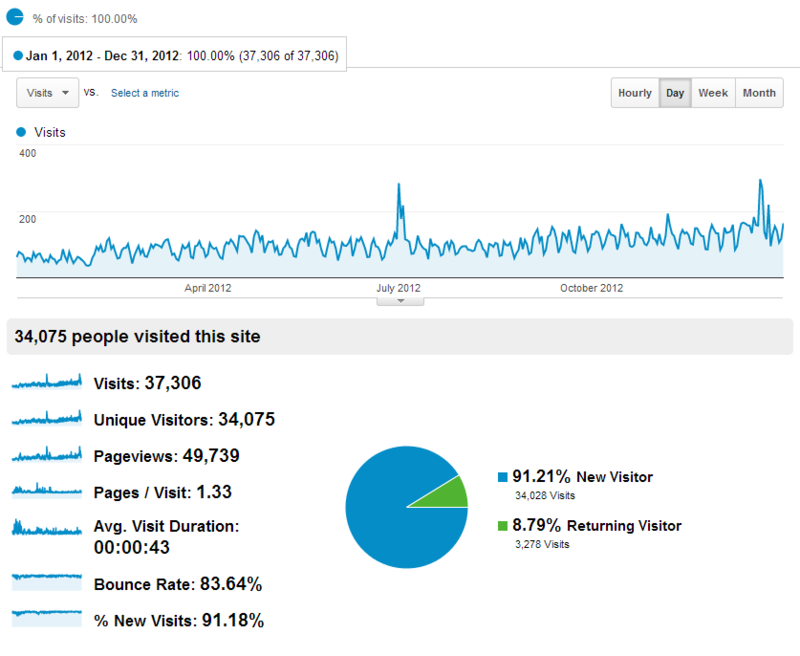 There’s been a steady increase of daily visitors throughout the year – even when I wasn’t writing anything new! My two biggest days were July 1st, when I shared out my best photos from No Place Like Dome festival, and then much more recently on December 20th, when, strangely, 188 people came to view my post about time zone oddities in Cambodia and Kuala Lumpur. That post is two years old but for some reason draws in a huge amount of traffic.. very odd! Anyway, I’m delighted to have had so many new people come to read posts on the blog. Whether it’s photos, WordPress functions, me talking away about technology, or writing about time zones.. you’re all most welcome and please feel free to leave a comment to say hello, I promise I will not bite. Last year I wholly relied on TripIt give me an estimate of my total distance travelled, however this year it seems to have gone a little mental. 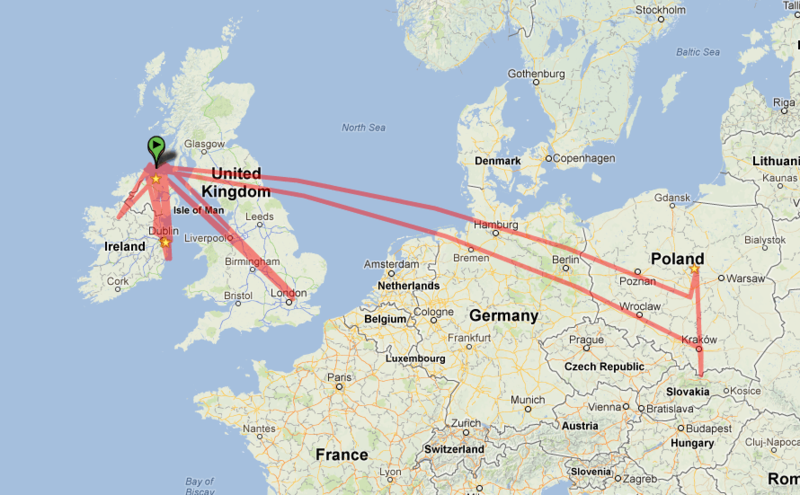 It’s estimating over 60,000 km, and I’m really not sure how it ended up at that. I’ve done a very rough estimate on Google Maps to cover my trip to Poland in June, my two trips to London, and various trips to Belfast, Wexford, Dublin, Sligo, and Navan. Here’s a visual rough guide. As a mental note for next year, according to Google Latitude I’ve got 104,583 miles on my clock – let’s see what that number is next year! I’ve been wholly static for an entire year! That’s pretty good going as I usually move at least once a year. We did make some initial movement towards looking for a new place but nothing jumped out at us. Obviously this is a pretty random statistic, and it’s not a raw count – as it doesn’t count the photos I’ve deleted for being out of focus, boring, or just plain bad. A more gradual increase from last year. In 2011 I took 2,813 and in 2010 I took 1,082. There was also a very large gap with July, August and September seeing basically no photos (due to my camera having taken a flying leap onto a stone floor and me taking ages to fix it). This means about as much as paying attention to “Klout” 1. Still, it is interesting to see the big jumps in follower count at certain points. I believe the biggest spike is when Dave Powell included me in a shared circle. I do have a very gradual increase in the number of people I am following, but no big spikes. 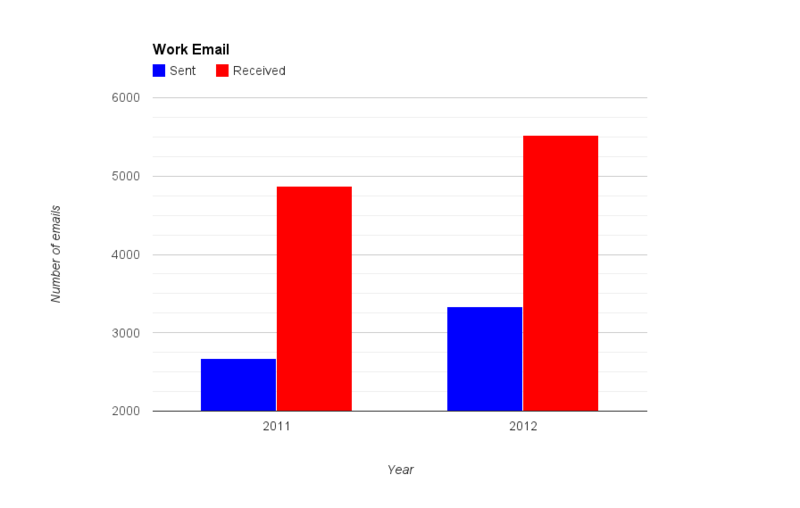 Quite the increase in work email traffic, and a big drop in the number of personal account emails sent. My average number of scrobbled tracks per year is now at 14,419 since I started tracking on Last.fm in November 2006. This year I pushed that average up, I guess with working at home and scrobbling from the phone a lot more. This year Autechre raced clean home, although that lead was definitely extended by the creation of an Autechre ‘community’ on Google Plus, which got me listening to a lot more of them in December. Overall, some pretty big changes from last year’s top 20, although I think a lot of that can be attributed to me not playing ambient music every night when I’m falling asleep. And here’s a lovely graph of my listening trends, courtesy of Last.fm’s Listening Trends in their playground. Simply based on the fact that I get 100 tracks a month, but this year I took two 3-month ‘holidays’ from my subscription. I did pick up some stuff of Amazon Mp3, Bleep and Bandcamp, but that pretty much covers it. I’m definitely thankful for the option to take a subscription holiday on Emusic, as funds were pretty tight this year. Sadly I can no longer see any obvious way to see the number of Google searches I made. I’m pretty sure it was available before, but now all they show is a graph with no numbers on it – really not very informative. My total number of searches on Google is 31,627 2. So at least I have a metric to work off next year. That gives us an average of 4,889 searches per year. That’s it. I can’t take it any more.. this has taken way longer than expected. I should time how long it takes next time and add that in as another metric. If you’re reading this on New Year’s Eve, get off your computer and get out somewhere. Here’s to a happy and healthy 2013 for you, my friends, and family.